Up first is the product that we got the chance to choose which shade we got. So this is a loose shadow from MARSK which I've received stuff from before but to be honest, I wasn't all that interested in loose shadows because of the mess, but I do like that this is a pretty Vanilla kind of shade which hopefully will make a great all over the lid shade. I was a savage when opening the box so that got messed up and ripped to shreds, and I made a bit (a lot) of mess when opening the tub as I peeled off the sticker and the powder flew everywhere which wasn't fun. But I'm hoping this isn't going to be an issue every time I want to use it. Upon swatching, it's a very pretty shimmery vanilla shade, as the name would suggest, and I think it would be a really nice highlighter on the tops of the cheekbones and inner corners so definitely going to be trying that out. Although I found it blended into just a sheen and not much colour showing so I may need to use it wet to add intensity. I just don't like the mess of a loose eyeshadow and the packaging isn't the best, it feels quite cheap so I just hope it can do it's job properly. This is a Birchbox Exclusive, and it has a huge wand which I really hope will apply the product to my lashes and not my eyelids and everywhere else on my face. I'm always reluctant to try mascaras as I have watery eyes and I find mascara always smudges on my lower lashes and onto my eyelid and that's not a good look. So I will have to see how this guy works out. When I saw this price to this product I didn't really want to try it as I don't want to love it and then have to part ways with either £67 or a good skincare product. But this is a professional treatment packed with pharmaceutical-grade crystals and Lactic Acid to polish and refine the skin texture. They also claim it diminishes fine lines and reduces scarring from first use so we shall see if it does anything magical for my scarring and fine lines. I always like receiving hair masks in my boxes as although they are quite boring, they're great for travelling and it's always nice to treat your hair with some TLC every once in a while. This is a nourishing treatment, containing strengthening Rice Protein, hydrating Jojoba Oil and moisturising Shea Butter to protect hair and add shine. Who doesn't want that right? Again, another brand I've received in beauty boxes and I tend to give them to my Mum or friends as I have very sensitive skin and my legs get very itchy and sore if I use something with fragrance which this unfortunately does, although it's very close to the bottom of the ingredients list. Now this body cream does have some good ingreidents in it too, like Avocado Oil, Shea Butter, Cocoa Butter, along with Green Tea, Rice Protein and Orange Peel. So it's great for hydrating and nourishing the skin, but it will also firms and smooths any imperfections or blemishes which is great for a body cream so I may give it a try in areas that aren't too sensitive and see if it stands up to the claims. This month we got to chose whether we upgraded our box, paid another £3 and got this beautiful bracelet, which I obviously did. I don't have many bangles like this (although I did get one for my birthday which I love) so I really like that this one is not only a bangle, but also has ribbon on it so it can be adjusted to fit my skinny little wrists. 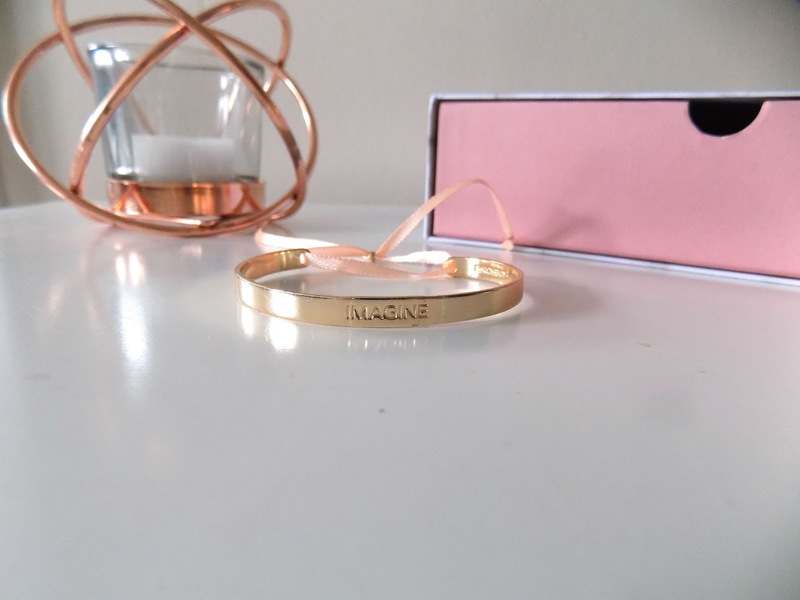 I love the rose gold colour and it says Imagine on it which is very on trend right now to have words on jewellery so I love this and will definitely get a lot of wear out of it. Also received this is this month's Look Fantastic Box, that's the second month in a row I've received a similar if not the same product in these two boxes. Buy anyway this is a very on trend skincare product, the ones I've tried before were coffee based but this is a charcoal based body exfoliator which we all know is great for detoxing the skin and giving you nice smooth skin. Frankly the coffee scrubs aren't my favourite, but I shall give this a fair shot. It has Kaolin Clay to absorb excess oils and impurities from your skin, Cucumber Seed Oil and Argan Oil full for pore detoxifying Vitamin B for clear skin. There's also Active Carbon from Bamboo to detox, purify and absorb excess oil for squeaky clean skin. It's 100% natural, Cruelty Free and Vegan, and free from plastic micro-beads and no parabens. Sounds great for both the skin and the environment so I really hope I like this. This dinky little tube was in this rather large excessive box and has a charm attachment so it can go on your phone or bag or purse, I don't really see why they still make products with these on but there you go. It smells great and it's supposed to be volumising and nourishing, which can be applied on it's own or as a plumping primer before your lip colour. I don't know whether I will get much if any use out of this but I will try it and see what I think. A super silky powder Blush is a great way to brighten up your complexion and any makeup look especially with this beautiful Coral shade. Unfortunately this isn't the kind of blush I go for as it's just too orange which is not a good match for my skin tone, if it was a bit more muted and peachy pink then yes, but this I know won't work for my skin so it will be going to a friend who can get use from it. But I have swatched it as it is very smooth and not too chalky, very pigmented and matte so I think it's a great formula, obviously I don't know what the wear time is on it but I hope with how pigmented it is, it sticks around for a while. I've never actually tried this but I'm really excited to as I love these multipurpose balms that can be used for any dry irritated skin and even things like smoothing down flyaways or adding a nice sheen to your cheekbones. It has Aloe Vera, Olive Oil and PawPaw to nourish and soothe the skin. It's fragrance free which is great for my sensitive skin, and I like that it can be used on the lips, skin, hair and nails. It's vegan and cruelty free which is amazing. Definitely a handbag essential. I'm pretty sure this was in a box last month, or I've received it before, I've never actually tried it, mainly because whenever I've used Caudalie products my skin has erupted into tiny red bumps that are painful and irritating. But this is a lightweight gel/cream, rich in powerful Antioxidants and patented Polyphenols to help calm reactive skin and restore it's water reserves to make it more resilient. So I hope it doesn't irritate the skin as I like the sound of what it can do. I'm not massively impressed with either boxes, there's only a couple products in each box that I like. From Birchbox the Marsk Eyeshadow is interesting to me and I'm keen to try it, along with the Hair Mask from Kueshi, the bracelet is probably what's going to sway the vote to Birchbox because I really love it, and although I had to upgrade my box by £3, it's great considering it feels like a really well made, good quality piece of jewellery. Glossybox does have the Paw Paw Balm, which I'm really excited to try, along with the Scrub Love Body Scrub. But I think it's going to Birchbox again this month. 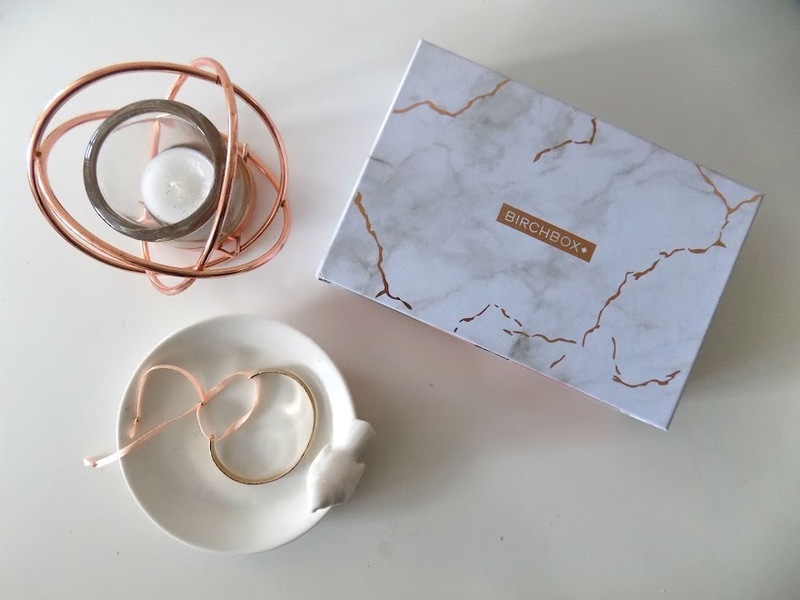 Last month Birchbox was my favourite, the actual box design is stunning and has it's place on my dressing table to catch odds and ends that I don't have anywhere else to put, but I just love the print, it makes me happy and adds colour to my space. In terms of the products, there was a Nip + Fab Colour Corrector in Banana which I've not used too much as I find it's too yellow for my skin, maybe the lavender or peach one would have been better but I will still try and use this one. The MannaKadar Powder has found it's way into my everyday makeup drawer. I like that it's undetectable on the skin, so I can use it when I'm not wearing foundation to just powder down some extra shiny areas and it's great for my travel makeup bag as it's small and compact. The other product that really stood out was of course the Oribe Dry Texturizing Spray which has pretty much all gone. I try not to use it everyday but I like this product. I don't feel it does amazing, life changing things to my hair, but more on that in an upcoming Is It Worth It post. The other two products I haven't used, one has gone to my Mum and the other is going to family and friends. They just don't interest me and I would rather someone else get use out of them than have them sit in a drawer going to waste. I wasn't all that impressed with the April Glossybox. I haven't really used the dual sided brush from Sport FX as it's too flimsy and doesn't really do a great amount, but I do keep trying to use it and hopefully I'll find a use for it. I have been seeing a lot of posts on Instagram about the brand though so I may check them out at some point. The Hand Sanitizer from Merci Handy lives in my handbag, the other one I got from the Look Fantastic Box is on my dressing table. Nothing special, smells reasonably nice, I prefer the other scent I got from them but I like that they're mini and smell good and don't have a strong alcohol scent to them. The Model Co Contour Stick was way too orange for me so that's also in the giveaway to family and friends pile. Although I love contour sticks, having fair skin means it's difficult to find one that actually works for my skin and this one was far from it. I've not tried the Mascara from Rodial or the Cleansing Conditioner from Elgon yet, to be honest the mascara is in my drawer and the conditioner is in the giveaway pile to f & f pile box too as I don't see myself using it, although it does seem like a great concept so maybe I will. I'm undecided as you can tell. If you like to see updates from the previous month and my thoughts on them then let me know and I can continue doing this. 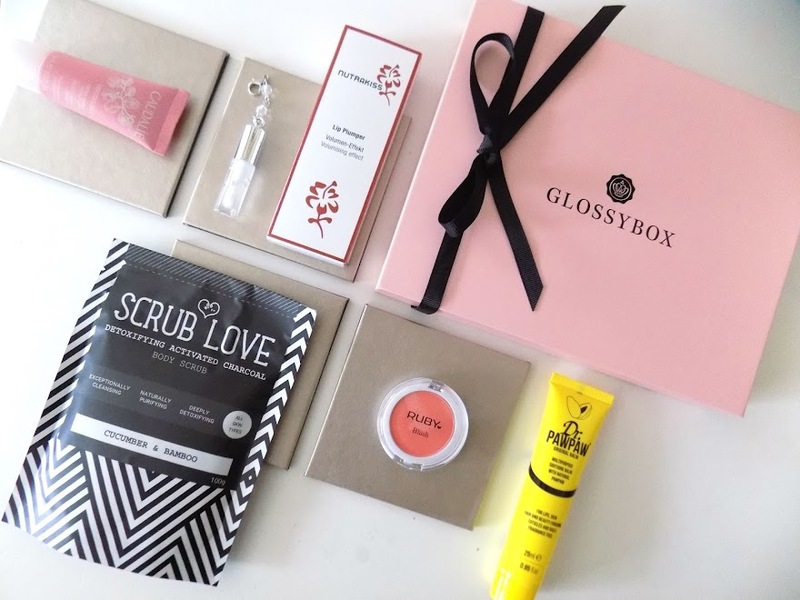 Check out last months Birchbox VS Glossybox here.